Yoruba actress, Funmi Awelewa, who took the pain of searching for kid Taju, who trended on social media some weeks back has not had it rosy with some fans who have been made attempts of dragging her in public. The actress along with some other celebs picked interest in the young Taju after a video of him being mocked due to the fact that he could not speak English trended. The young Taju was eventually located in Ibadan, where he was brought to Lagos and has God continue to favour with people pledging support to sponsor him through school, things have been daisy beneath. 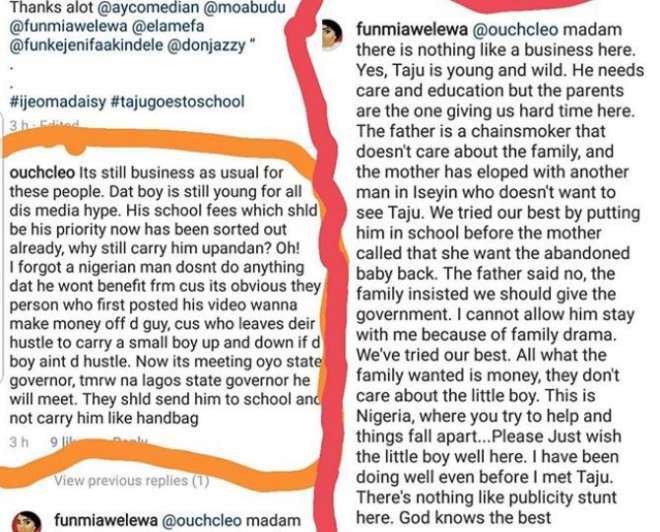 After a fan had alleged that the actress and other celebs were using the little boy to trend and make a name for themselves, Funmi had to come out plain by stating that they needed to hand the boy over to the government because his parents were never interested in his success rather after the money.